Fresh jumbo chicken wings, fried crispy and tossed in one of our signature sauces. Signature Sauces: Buffalo, Makers Mark® BBQ, Malibu Coconut Sweet Red Chili, Guinness® Glaze, and Traditional Teriyaki. Warm spinach & artichoke blended with Guinness®, mozzarella and parmesan cheeses. Served with toasted pita wedges. Made fresh daily from Glenview Farms* goat cheese, combined with cream cheese and topped with marinara sauce and toasted almonds. Served with toasted pita wedges. Hand cut breaded slices of calamari steak, flash fried crispy on the outside, tender on the inside. Served with marinara and sweet chili sauces. Crispy fried shrimp and jalapenos drizzled with a creamy, spicy sauce. Chilled strips of seared Ahi tuna. Served with traditional ponzu sauce and wasabi. Lightly breaded pickle spears, deep fried golden brown and delicious. Served with our homemade creamy dill dressing. Fresh baked soft pretzels topped with sea salt. Served with our homemade dipping sauces: Guinness® Mustard & warm cheese dip. A select combination of our signature fried calamari steak, seared Ahi tuna, spinach & artichoke dip, and goat cheese dip. A crispy tower of English Ale battered silver dollar mushrooms and thick cut onion rings. Served with two tasty dipping sauces. English style ‘proper’ potato chips, piled high and topped with cheddar cheese, bacon, scallions and BBQ sauce. Mushroom caps stuffed with spinach and Spanish artichokes. Finished with mozzarella and bread crumbs. Served with toasted baguettes. Wedges of brie cheese hand dipped in a light tempura batter and gently fried until golden. Served with a raspberry compote. Marinated portabella mushrooms with fresh crabmeat, mozzarella and balsamic reduction. Served with char grilled asparagus and field greens. 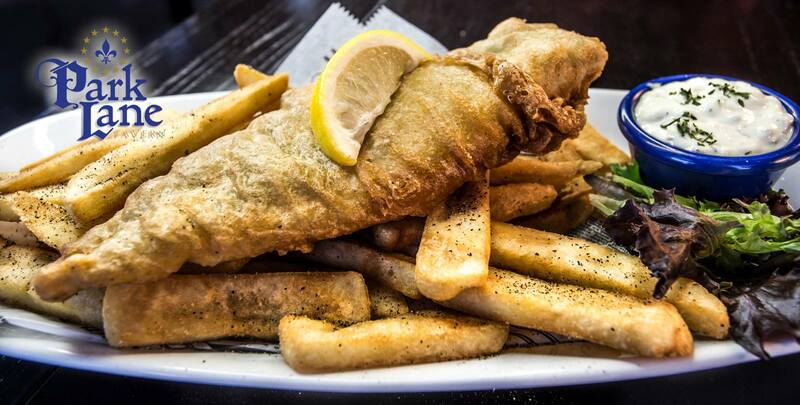 English ale battered and fried to order whole Atlantic Haddock filet on a bed of fresh tavern fries. Served with house-made tartar sauce. A perfect blend of USDA choice ground beef and lamb with our signature house-made bordelaise and chive whipped potatoes, peas, carrots, and parmesan bread crumbs. Served with fresh field greens. 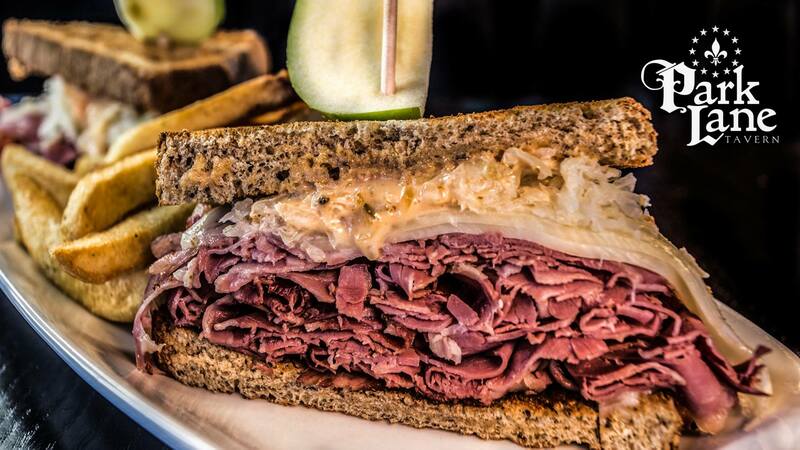 Magners® Cider marinated USDA corned beef brisket that is slow cooked and thinly sliced in house. Paired with Harp Lager braised cabbage and bacon, chive whipped potatoes and whole carrots. Hand flattened pork loin fried and topped with traditional onion and mushroom gravy. Served with kraut, warm potato salad & green beans. 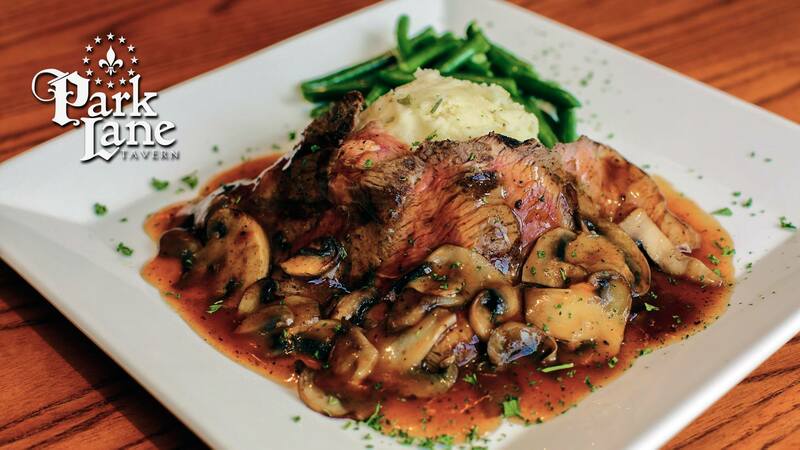 Tender char-grilled sirloin steak thinly sliced, topped with sautéed mushrooms and a rich bordelaise. Served with fresh sautéed green beans and chive whipped potatoes. Fennel infused pork sausages, char-grilled, over chive whipped potatoes and covered in our house-made Old Speckeled Hen Ale-onion gravy, fresh snap peas and whole carrots. Served with field greens. Hand breaded chicken tenderloins served with tavern fires. Tossed in one of our signature sauces. Salmon filet will dill capers, white wine and butter. Served with sautéed redskin potatoes & fresh green beans. 10oz center cut sirloin char-grilled to perfection. Accompanied by fresh sautéed green beans & chive whipped potatoes. Finished with a Knob Creek Small Batch Bourbon whiskey bordelaise. Marinated grilled chicken breast, Applewood bacon, Swiss & cheddar cheese, topped with a thick-cut beer battered onion ring & our signature bourbon BBQ aioli. USDA corned beef brisket slow roasted daily. Steeped in Magners® Cider and brown sugar. Topped with sauerkraut, Russian dressing, Swiss cheese, and served on rye bread. Fresh turkey breast, roasted in house and sliced to order. Applewood bacon, lettuce, avocado, tomato, Swiss cheese and house-made cider aioli. Served with tavern chips. Char-grilled chicken, sliced Granny Smith Apples, soft brie cheese, our house-made sweet cranberry coulis and cider aioli. Served on an artisan French baguette. Served with field greens. Triple decker with shaved black forest ham, slices of fresh char-grilled chicken, house-made sweet cranberry coulis, cider aioli, topped with Gouda cheese, and tempura fried. Grilled marinated portabellas with lettuce, tomato, onion, roasted red peppers and goat cheese spread. Served on ciabatta. Thinly sliced seasoned beef, roasted in house and piled high with provolone cheese, caramelized onions and house-made bordelaise for dipping. Broiled or Fried English ale battered fish, topped with lettuce, tomato and onion. Served on a soft Brioche roll. Served with Tavern Chips. Ask Your Server for Details. An 8oz. fresh ground chuck char-grilled to order. Build your own burger with our signature toppings (see below for a list of toppings). A juicy ground chuck burger stuffed with bacon and Gouda cheese, then topped with cheddar cheese, crispy applewood bacon, onion tanglers, and a BBQ aioli. All white turkey breast, perfectly seasoned. Topped with fresh avocado, cider aioli, served on a wheat roll. Short rib burger topped with fried jalapenos, sriracha mayo, and ghost pepper cheese. Short rib burger piled high with thinly sliced Park Lane signature Magners® Corned Beef, beer braised cabbage, Swiss cheese, and Russian dressing. 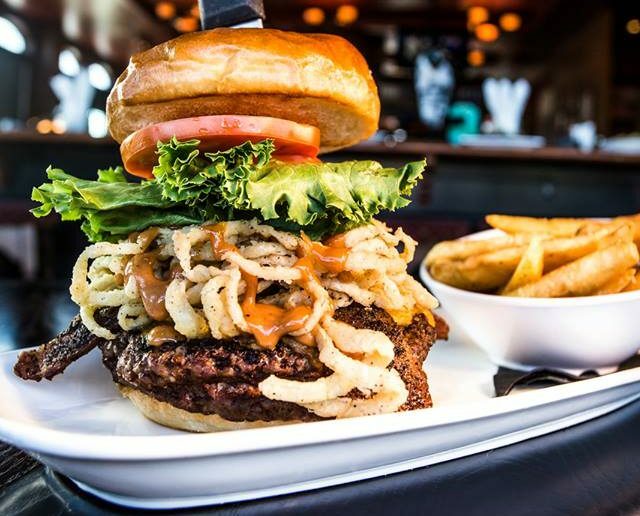 *Signature burger toppings (50 cents each) include: cheese, sauteed mushrooms, grilled onions, bleu cheese crumbles, goat cheese, onion straws, Guinness® chili. Hand tossed fresh field greens, Granny Smith apples, bleu cheese crumbles, bacon, onions, cucumbers, red and green peppers, mushrooms, Roma tomatoes, toasted almonds & craisins. Torn hearts of romaine, tossed in Caesar dressing topped with Asiago cheese and house-made croutons. Field greens tossed with bleu cheese crumbles, onions, Roma tomatoes, and Applewood bacon topped with thinly sliced, cooked to order sirloin steak. Field greens, hard-boiled egg, Applewood bacon, cheddar cheese and mozzarella, onions, and Roma tomatoes, topped with crispy fried or grilled chicken. Choice of a classic house salad of field greens topped with a blend of vegetables or a petite Caesar salad. Chopped romaine topped with dried cranberries, bleu cheese crumbles, red onions, sweet pecans, mandarin oranges, and a grilled chicken breast with orange cranberry vinaigrette. Chilled strips of seared, Ahi tuna served over field greens with red and yellow peppers, onions, and fried wonton strips with sesame dressing. Fresh mozzarella, basil, and sliced garden tomatoes on mixed greens with a balsamic and extra virgin olive oil drizzle and fresh cracked black pepper. *Consuming raw or undercooked meat or fish may pose an increased risk of food borne illness. Meat lovers pizza covered in authentic hangers, black forest ham, crispy bacon and sliced pepperoni. Covered in mozzarella cheese over our savory pizza sauce. Ricotta, mozzarella, parmesan, and Asiago cheese. Topped with fresh spinach and Roma tomatoes over homemade garlic aioli. Loaded with fresh vegetables! Portabella mushrooms, red & yellow bell peppers, onions, Roma tomatoes and mozzarella cheese over our savory pizza sauce. Features the traditional four cheeses. Parmesan, provolone, Asiago and mozzarella cheese smothered over our savory pizza sauce. Battered Atlantic haddock with bottomless tavern fries. Served with house made tartar sauce. Fennel sausage char-grilled, over redskin mashed potatoes, with ale-onion gravy, peas and carrots. 3beef sliders on silver dollar rolls with cheese and bottomless tavern fries. 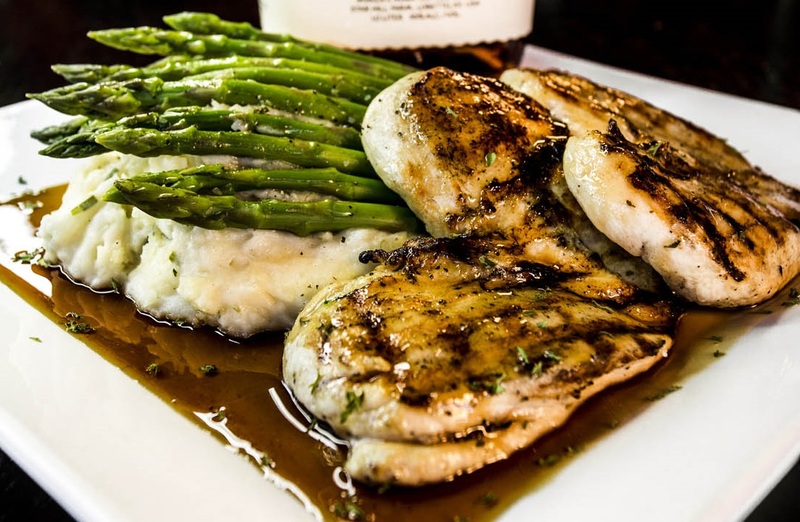 Grilled chicken breast served with redskin mashed potatoes and green beans. Chopped romaine topped with dried cranberries, sweet pecans, mandarin oranges, and a grilled chicken breast with orange cranberry vinaigrette. Tipsy berries and sautéed with brandy atop fried pound cake and authentic English custard. Guinness® stout brownie topped with vanilla bean ice cream, chocolate sauce, whipped cream and toasted almonds. New York style cheesecake, served with fresh bananas, banana liqueur, caramel sauce and whipped cream. Our own house made recipe topped with Irish whiskey sauce and paired with vanilla bean ice cream.